This track-day Gold Star has been built up with many goodies from specialist Phil Pearson, including a 604cc conversion. But don’t worry, owner Barry Winter’s got a stock Goldie as well! Barry Winter is a lucky man, but it’s the kind of luck that comes out of sustained effort. 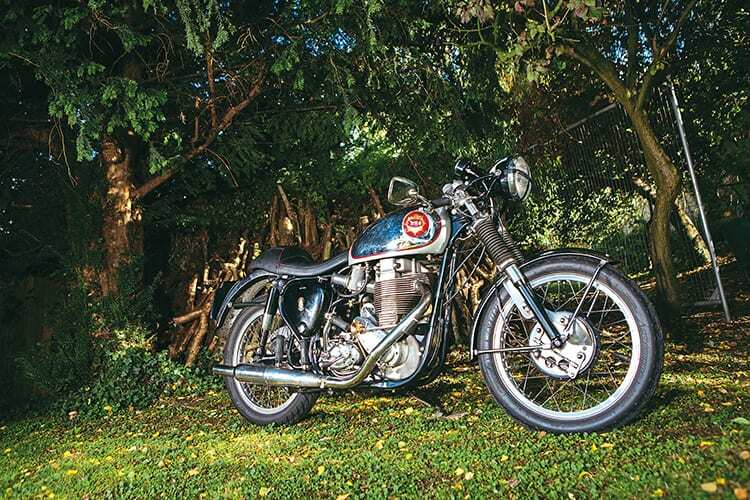 With a successful career as a skilled engineer at the Environment Agency behind him, he could concentrate on his small, interesting collection of classic bikes; some of them have featured previously in these pages. But the story of perhaps the collection’s high point, this 604cc Gold Star, which he uses mostly on the Island and for track days, began back in the day, and has a complexity unexpected in such a monolithic motorcycle. For there’s another Gold Star in his garage. So time passed, and when circumstances allowed early in 2002 it was this original bike that the big engine – from Gold Star specialist Phil Pearson – was fitted into. Barry had provided Phil with the 500’s set of crankcases, as back then cases and cylinder heads were the only Goldie engine components Pearson could not supply new, and Phil did the conversion, details of which later. But for over 40 years Barry had also kept a new 1955 frame, and three years ago decided “because I had so many bits left over” to put together a purpose-built version, mainly for his increasing participation in track days… though it was also to be road legal. So he fitted the big engine into the new frame. It also had Pearson’s five-speed gearbox conversion, in standard BSA cases but stamped ‘Pearson’, featuring Nova gears; the original RRT2 close-ration four-speed box went back into the original 500. The extra ratio is a real bonus on any Goldie, famous for their need with the RRT2 to slip the clutch up to 30mph, on a first gear that can do 60! I once test-rode Phil Pearson’s own five-speed 604cc Gold Star, and the set-up, which included Pearson’s Suzuki GS550-based clutch, half the weight of a BSA or Triumph one, was a distinct improvement. However, as Barry noted, moving off you do still have to slip the clutch, but less. Barry has opted for a Bob Newby belt-drive and clutch on his 604. He found a new set of cases for the 500 engine and built it into a complete bike again, one which currently wears a Lyta-style five gallon alloy petrol tank, while the 604 sports the original, unique and iconic Gold Star one, with its circular five-inch scarlet badges, butterfly cap and curling breather pipe – as well as a ding sustained on a sortie to the Isle of Man. The big 604cc’s dimensions are 90 x 95mm, against the standard 499cc’s 85x88mm. The American Wiseco company, which now supplies all Pearsons’ wide range of pistons, used Yamaha XT500 dimensions on this one, which gives a compression ratio of 8.75:1. A Jawa speedway conrod runs via a needle roller I.N.A. bearing on a 35mm big end pin. The chromed molybdenum steel crankshaft, one of four variants that Pearson offers at £825, is an extended one; another variant of this can be used to fit an alternator. The drive side shaft is 30mm and the timing side one-inch diameter. This extended crank is pressed rather than bolted together, and runs on five main bearings – that’s two more than standard – to counter the standard racing Gold Star engine’s Achilles heel, its bottom end at speed. Numerous classic racing successes, like Dennis Gallagher’s third place in the 1999 Junior MGP on a Seeley-framed short-stroke 350, attest to its strength. The 604’s balance factor is between 50 and 60% – these engines will not loosen your fillings – and despite the extra capacity, the 604 is the same height in the frame as the 500, since the gudgeon pin is 4mm closer to the crown than on a BSA piston. In the bored-out cylinder, the lining is of non-magnetic, austenitic iron. The conrod to crank angle is 1.73:1, against the stock angle of 1.86:1. Barry’s engine features DBD valves. The 604, along with exceptional torque, claims an output of 48bhp, compared with a good stock 500’s 40bhp, or top US competition engines giving 45bhp @ 7200rpm. The bigger engine with the five-speed box is also claimed to give 50mpg, 10 more than a hard-ridden DBD 500. Top speed? Pearson will tell you one 600 conversion owner’s chronometric speedo went past the 120mph max and bent its needle! Cycle parts on Barry’s 604 include one of the first of Pearson’s eight-inch 2ls front brakes; today he also offers ones for the alternative 190mm brake at £675, or £635 for the former. On the stainless front mudguard, a big U-shaped bracket is fitted to connect and stiffen the fork legs. The exceptionally shapely and well-fitting racing seat with its rear hump came via the GSOC from Paul Moss (01132 865662). The 19 inch wheels are original Dunlop alloys. The electrics, in keeping with the bike’s roadgoing capabilities, have had a 12 volt conversion using a solid state regulator and the standard dynamo; though currently a dummy is fitted, behind a non-standard chromed magdyno cover, part of weight-saving for a recent track day at Castle Combe. The magneto was rebuilt by Dave Fisher.